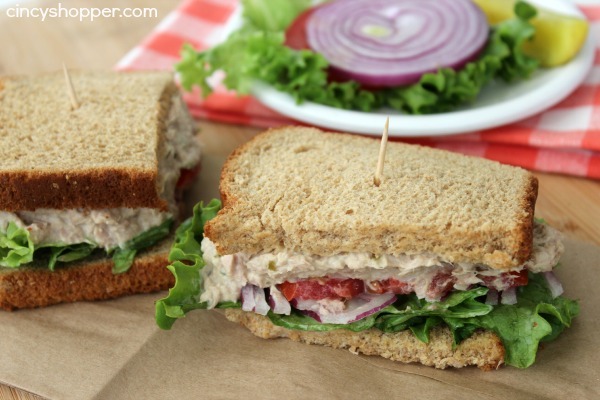 If you like tuna sandwiches you are going to be liking this CopyCat Panera Tuna Salad Sandwich Recipe. Since spring has finally arrived (I think, ha ha) we decide to have sandwiches for dinner last evening. One of my favorite sandwiches during the warmer months happens to be a Panera Bread Tuna Salad Sandwich. Occasionally my daughter and I will drop on to Panera Bread and share a quick sandwich while out shopping or running errands. There is something totally addicting about a Panera Tuna Salad Sandwich. The combo of bread and veggies together is great. I will quite often crave a Tuna Sandwich from Panera. Unfortunately the budget does not allow for me to satisfy that craving as frequently as I would like ha ha. 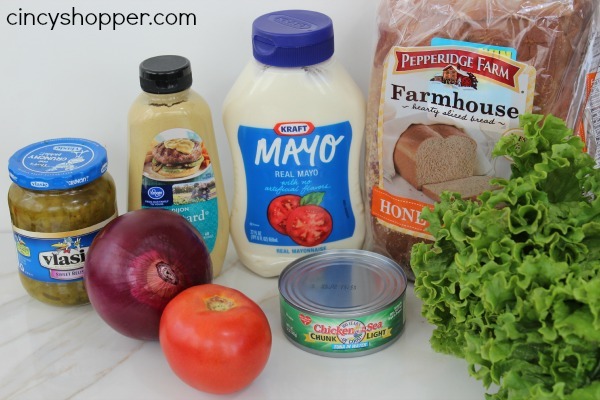 My hubby was on a mission and decided he would make us this CopyCat Panera Bread Tuna Sandwich Recipe so we could all enjoy a sandwich at home. 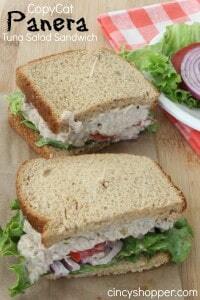 This Panera Tuna Salad Sandwich Recipe is so simple and inexpensive. I fed the whole family lunch for a fraction of the cost of making a trip to Panera Bread. 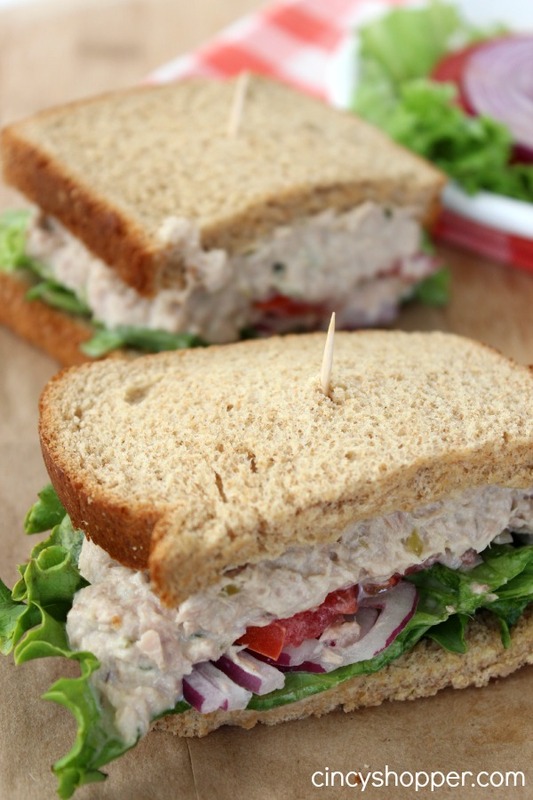 Just grab your bread, tuna and a few other items and make your own Homemade Panera Bread Tuna Sandwiches. These sandwiches turned out GREAT! I know I will be saving myself some $$’s this spring and summer with this recipe. Plus we will be enjoying Panera Bread Tuna Sandwiches more often. 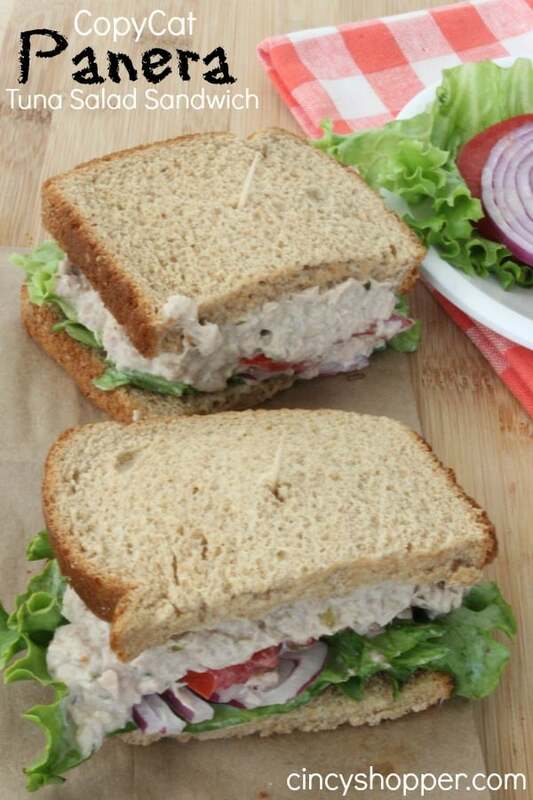 Are you a fan of Panera Bread Tuna Salad Sandwiches? Do you get the cravings? ha ha. I feel the same way about the same way about those Panera tuna sandwiches!!! Can’t wait to try this!! thanks for the great “secret”! can’t wait to make this! thank you.cant wait to try these sand. These are delicious! Best tuna sandwich we ever tasted!! Hubby loved them. Thanks! Thank you for sharing this recipe. My kids love Panera and I think they’ll love this sandwich. I hope you don’t mind if I share this on a sandwich round-up with a link back. Tuna is package of how many ounces? Is it right teaspoon for mustard, mayonnaise, relish and not tablespoons? I agree it was too dry for only teaspoons. I ended up putting in more of every thing. 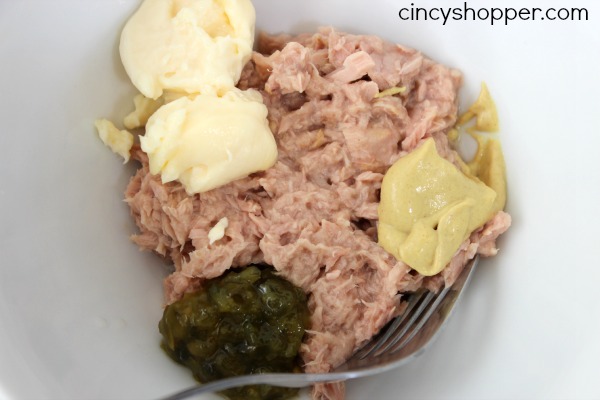 This has to be the simplest tuna salad on the face of the planet! BUT….a I’ve added diced celery (very small dice) to give it a nice crunch texture and a small amount of celery salt . Another addition to the salad is angel hair coleslaw! Double your recipe the add 2 handfuls of the angel hair coleslaw and mix well….everyone I’ve made it for loved it. That looks so good and I haven’t had tuna salad in far too long! If I don’t have relish is there anything you can use . SHould the measurements be tablespoons not teaspoons? Seemed very dry! I am actually working on the weight watchers program. Does the recipe make two servings or 1? Thank you for sharing such a simple and low fat recipe. The very best Panara tuna salad saldwich I have ever had was at their location on Coliseum Blvd. in Fort Wayne, Indiana, and it had a rather loose (goopy) tuna filling. With only 1 1/2 tsp mayonaise in this recipe, is it rather dry? I used a little plain Greek yoghurt with less mayo and it was great. I just love Panera’s tuna and considering I just about live on my own tuna recipe, I wondered what their secret was. Thanks! Gray Poupon mustard it is! Now, if I could only get the perfect recipe for their Autumn Squash soup……..